If you or someone you know has been injured in a trucking accident in Connecticut, hiring a knowledgeable truck accident lawyer in the state is of the utmost importance. The driving laws vary from state to state, but we specialize in the driving laws in Connecticut, and have the expertise and experience required to formulate a case around your trucking accident. Severe injuries can occur from a trucking accident, including but not limited to: broken bones, spinal cord damage, brain trauma, third-degree burns, and even a coma. If you have suffered from any of these injuries, you may be entitled to compensation. 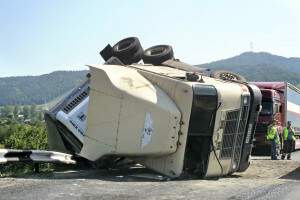 Evidence is crucial to trucking accident cases. The weather and passing cars and trucks can erode the evidence in a matter of time, so the sooner evidence is gathered, the better. This includes skid marks, yaw marks, and scuffs. A trucking company will have their own accident response team that will be on the scene of the accident immediately following, formulating a defense against your claims. If you have been injured in a truck accident, call us right away so that we can get the most factual evidence prepared for your case. A highway trucking crash that resulted in serious injuries to a mother and her two children caused when the trucker fell asleep at the wheel. A highway automobile crash that left our client with a significant lower back disability that prevented him from continuing his employment. A highway automobile crash caused by a reckless driver that injured a Girl Scout troop leader and several members of the Girl Scout troop. A highway trucking crash where a U.S. Drug Enforcement Agent was seriously injured in the line of duty. If you or someone you know has been injured in a severe trucking accident in Connecticut, don’t wait. Contact me today for a free case evaluation at (860) 246-2700.